Who doesn’t love nachos? My family LOVES nachos. We have switched from taco Tuesdays to nacho Tuesdays. 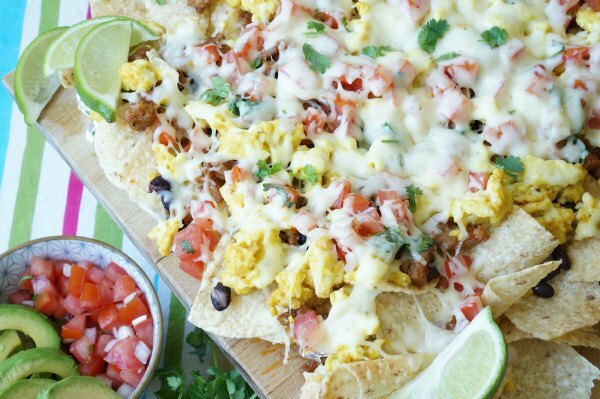 Nachos have become a blank canvas and we have fun topping them with different toppings. 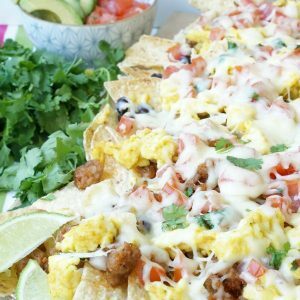 So, I took a chance and moved tacos from a dinnertime dish to a breakfast dish. 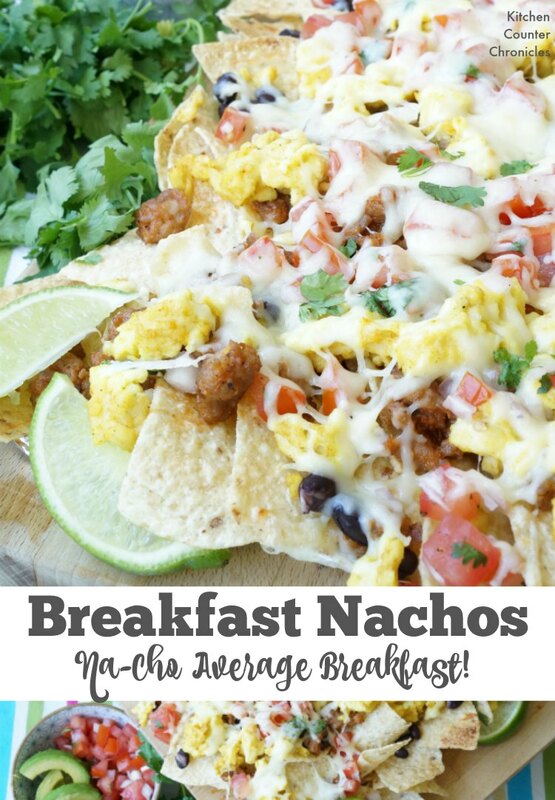 These breakfast nachos are na-cho average breakfast (coined by my 11 year old). Chips topped with crispy chorizo, silky scrambled eggs and fresh pico de gallo makes an awesome addition to any Sunday morning routine. 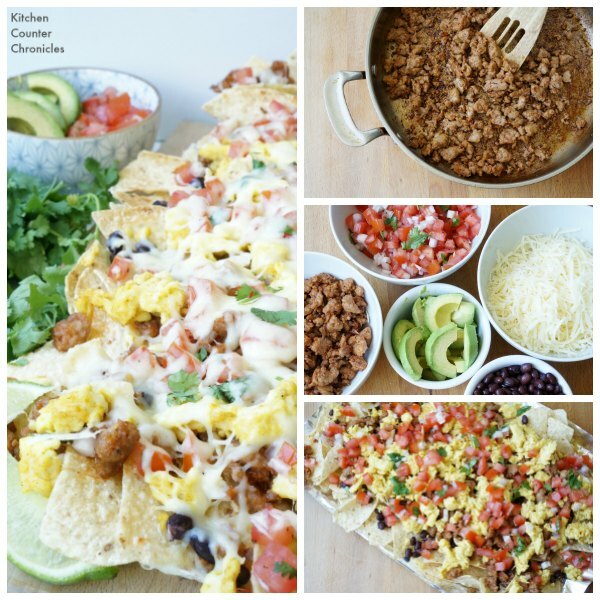 What would you add to your breakfast nachos? Cover a large baking sheet with foil. The nachos will be cooked under the broiler, so you will need to use foil, not parchment paper. We like purchasing our sausage meat in sausage casings, this way we can use only what we need and easily freeze the rest. If you are using sausages in the casing, cut a slit in the side of the sausage and push the meat out of the casing before cooking. Coat a large skillet with the vegetable oil over medium-high heat. Add the sausage meat and cook the chorizo and Italian sausage until brown and crispy. Break the meat into small pieces, so it can be easily scattered across the chips. If your family likes spicy dishes, don’t be afraid to add more chorizo sausage. Set aside. Next prepare the pico de gallo. Feel free to use your family’s favourite prepared salsa, but we prefer freshly made pico de gallo. To make pico de gallo, remove the seeds from the plum tomatoes and slice tomatoes into small pieces – place in a small bowl. Slice the shallot into small pieces. Add 1 tbsp of chopped cilantro and a squeeze of lime juice. Stir and set aside. Now, prepare the scrambled eggs. Whisk together the eggs, a pinch of cumin and 1 tbsp of milk. Cook and scramble the eggs in a large skillet over medium heat. Once cooked through set aside. 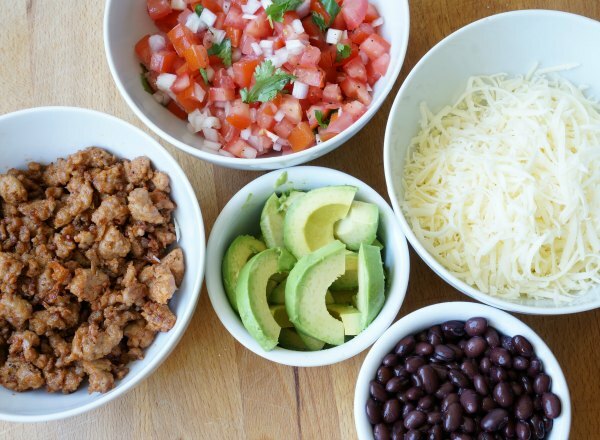 And, now it’s time to assemble the nachos. 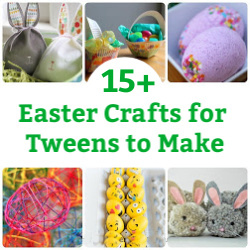 Get the kids in on this part. 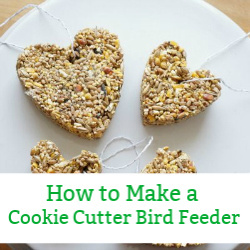 Begin with a layer of tortillas chips – cover the entire baking sheet with the chips. 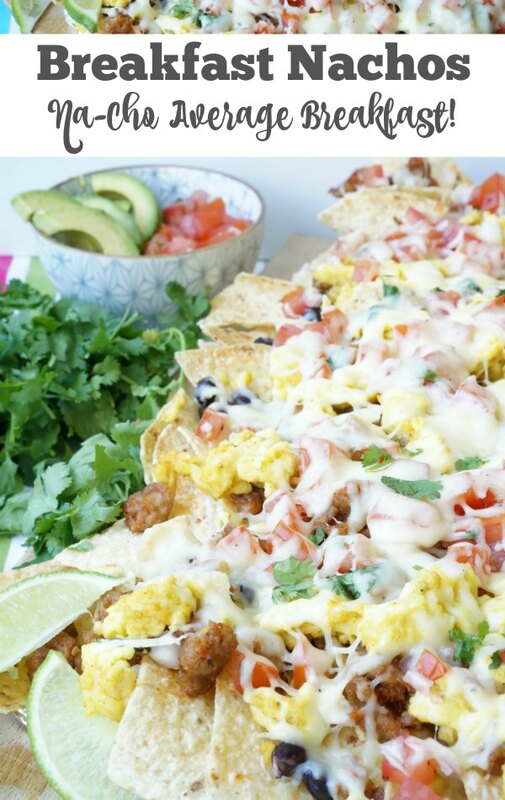 Scatter on the cooked sausage meat, the eggs, the salsa and top with the cheese. Pop the sheet pan into the oven, under the broiler, until the cheese is melted and the chips start to brown. Remove from the oven, transfer to a serving platter and serve with sliced avocados, additional salsa, sour cream and a sprinkle of cilantro. 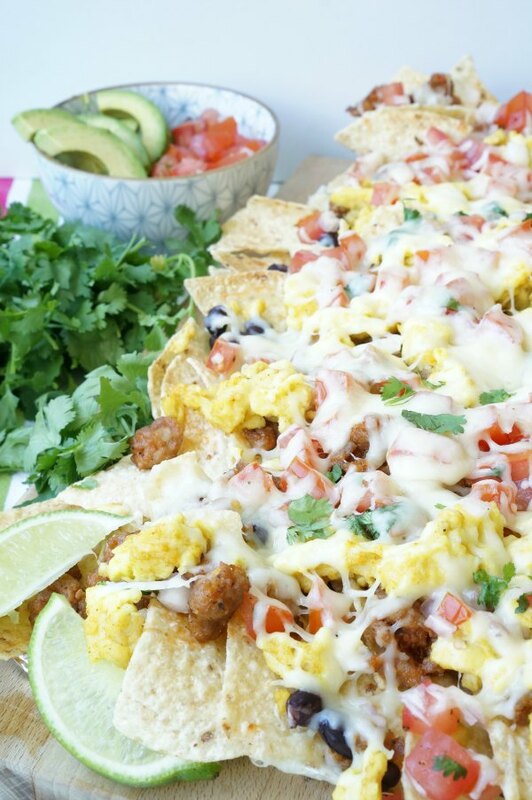 Nachos for breakfast? Yep! 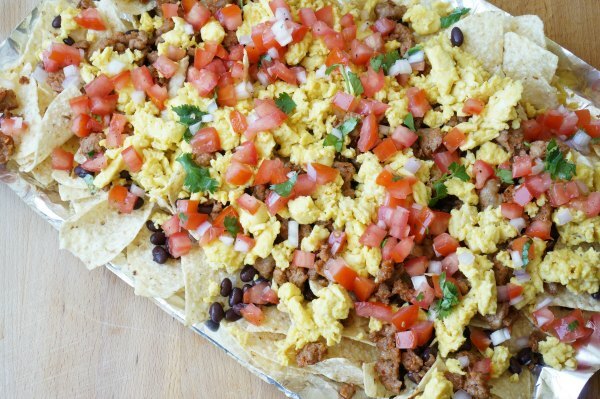 Topped with sausage, cheese, scrambled eggs and more. If you are using sausages in the casing, cut a slit in the side of the sausage and push the meat out of the casing before cooking. Coat a large skillet with the vegetable oil over medium-high heat. Add the sausage meat and cook the chorizo and Italian sausage until brown and crispy. Break the meat into small pieces, so it can be easily scattered across the chips. 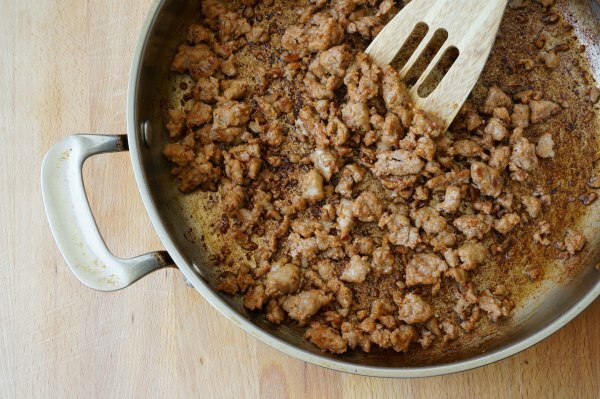 If your family likes spicy dishes, don’t be afraid to add more chorizo sausage. Set aside. To make pico de gallo, remove the seeds from the plum tomatoes and slice tomatoes into small pieces – place in a small bowl. Slice the shallot into small pieces. Add 1 tbsp of chopped cilantro and a squeeze of lime juice. Stir and set aside. Begin with a layer of tortillas chips – cover the entire baking sheet with the chips. 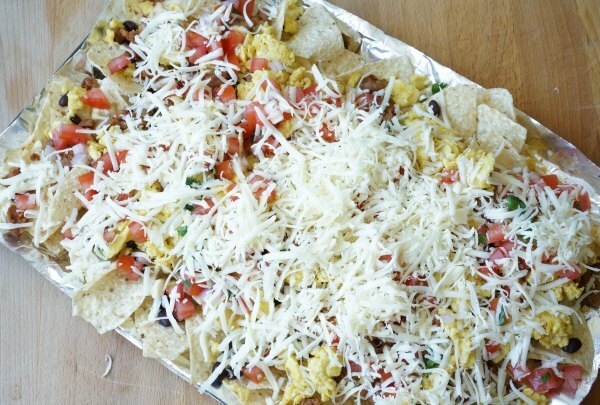 Scatter on the cooked sausage meat, the eggs, the salsa and top with the cheese. 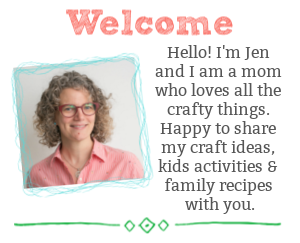 Today’s post is another of in our series of twists on Chef Jamie Oliver’s recipes. Check out Jamie’s Mexican-style omelette wrap for another delicious Mexican-style breakfast idea. These recipes would make a delicious addition to weekend brunch, lunches and dinner.